Story: Gingrich Criticizes FCC Management of E-Rate, 7/1/98. 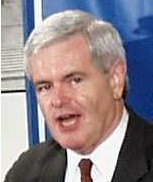 (July 1, 1998) House Speaker Newt Gingrich condemned the way the schools and libraries program is being subsidized during a trip to Silicon Valley on Tuesday. Gingrich said that it is wrong to allow a bureaucracy to raise a tax, and bad policy to allow a Washington bureaucracy to manage technical modernization. The "e-rate" is a Federal Communications Commission controlled program which is set to subsidize schools' and libraries' telecommunications services, Internet access, and computer networking. Congress codified the decades old practice of providing universal service support for high cost rural areas in Section 254 of the Telecommunications Act of 1996. In Subsection (h) Congress added a new mandate for universal service support for telecommunications services for schools and libraries. To the shock of some members of Congress, the FCC construed §254(h) to cover extensive computer networking expenditures, and initially set the level of subsidy at $2.25 Billion per year, to be collected from long distance phone companies, who in turn would pass significant charges on to their customers. "I think that it is very dangerous, and frankly wrong, to allow any appointed bureaucracy to raise taxes on the American people. The Constitution was written so that the Congress did that for very powerful reasons historically. And I don't think you want bureaucrats to be in the habit of raising taxes on the American people. This year it is a dollar. Next year it is ten dollars. Five years from now it is fifty dollars. They are not up for re-election. They don't have to go back home and explain it. They just take the money. Second, I cannot imagine any place in America better than Silicon Valley to make the case that a Washington based bureaucracy receiving ten, or twelve, or fifteen thousand applications, is the worst possible way to have technical modernization. You want a decentralized, experimental, entrepreneurial, innovative approach. You are not going to get that if you have to file forms in thirty-three copies to some bureaucrat in Washington who does not have a clue what is happening to the state of the art." Gingrich is hardly the first Congressional leader to attack the way the program is being run. Rep. Billy Tauzin (R-LA), the Chairman of the House Subcommittee on Telecommunication, is likely to introduce legislation to change the e-rate when the House returns from its July 4th recess. Rep. Tauzin described his proposal in a Dear Colleague letter. It would replace the source of funding from an FCC imposed tax on phone users, to an already existing excise tax on phones; it would shift control of the program from the FCC to the Department of Education; and it would distribute money to the states in the form of block grants. Senate Subcommittee Berates FCC, 6/11. Clinton Condemns "Digital Divide", 6/8. Riley Waits in Wings to Run E-Rate, 6/8. Debate Over "Gore Tax" Heats Up, 6/5. AT&T's Universal Service Charges, 5/28. FCC Reports to Congress on SLC, 5/11. Similarly, Sen. Conrad Burns (R-MT), the Chairman of the Senate Communications Subcommittee, will likely introduce a parallel bill in the Senate when it returns on July 14. In contrast, many Democrats continue to support the e-rate as it is currently configured. Rep. Earl Blumenauer (D-OR) is working to rally support for the FCC run program. In an interview just prior to leaving for the week long 4th of July recess, Blumenauer stated that what Congressmen hear back in their districts will be important. "If people go home and they hear from the libraries and schools, it will be hard to turn their backs on them." Also, several education groups are trying to mobilize their members to contact their Representatives and Senators. Regarding the Tauzin proposal, Blumenauer stated, "This is apples and oranges. This is a tax that has been paid for one half a century." He further described the Tauzin proposal as a "tax reduction" bill. However, Blumenauer said that he "wouldn't rule it out as a last resort" to maintain funding.